In a rural town in India, Shehazvi takes her daughter to see to a doctor for stomach pains. The reason for the pains is salty drinking water. She has to spend 200 rupees every time she needs to take her daughter to the doctor. In a land scorched by the sun and dry due to lack of rains, she has no choice but drink the salty water, as there is no grocery store for her to purchase bottled water, no on-demand tap of drinking water, and no reliable electricity. “Excessive salt intake can be quite detrimental to one’s health, both in the short and long term,” says Maulik D. Majmudar, a cardiologist at Massachusetts General Hospital. A resident of Mhasawad, a village with around 8,400 people, Shehazvi works as a teacher. The village is flanked by the Girna River in Maharashtra, India. Shehazvi has started paying 30 % of her monthly income to get treated water from a reverse osmosis (RO) plant as she cannot bear to see her child suffer after drinking salty water. She feels it is worth it as the RO water has 75% lower salinity compared to the untreated town water. The water that is supplied is contaminated, and my daughter was always in pain. I had to repeatedly take her to the doctor in Jalgaon, and it was very expensive. So I started buying filtered water. Now the stomachaches and the illnesses are gone. However, many Mhasawad residents are not able to afford RO water despite the benefits. They rely on the untreated water which contains a salinity level over 1,200 ppm. According to the WHO, drinking water should contain less than 600 ppm. At its worst, water in a place like Cambridge, Massachusetts has just about 350 ppm. One man in Mhasawad spends about 20,000 rupees per year to get treated for kidney stone problem. People are worried for their children’s health as many suffer from stomach pains and continuous digestive problems, which hinder their school lessons as well. Sometimes, the pains get so bad, the school has to send the child to hospital. Amos Winter, an assistant professor in the Department of Mechanical Engineering, and PhD candidate Natasha Wright, a researcher in Winter’s GEAR Lab and a fellow of the MIT Tata Center for Technology and Design — which supports this and other GEAR Lab projects for the developing world, decided to design an economical water treatment system that was applicable to rural Indian villages. They knew the first step to their project was talking directly to the residents themselves. We are in the field every six months trying to figure out how socioeconomic factors influence technical factors. We walk the lines between product designers, machine designers, ethnographers, and social scientists, and it’s at the convergence of all those perspectives that disruptive new solutions come together. Wright traveled to Jalgaon in August 2012 to meet with engineers at Jain Irrigation Systems. Together, they would develop a system that would pave the way to achieving the company’s vision of providing villages in India access to reasonably priced potable water. The company’s plan was to build economical home water systems that would eliminate the biological contaminants found in the water. During his first two trips to Jalgaon, Wright researched commercially existing systems to see how they worked. I went to villages and interviewed women’s groups, men’s groups, and individual families. I was focused on the removal of biological contaminants and was hearing that a lot of villagers had filters but weren’t using them regularly. I wanted to figure out how to improve the water and increase the likelihood of filter use to prevent sickness. When I reviewed my survey results. I realized that everyone was complaining about salt, even though I never even asked about it. They said it tastes bad, leaves marks on their pots and pans, and makes their stomachs hurt. Wright and Winter feel that by providing a community system that could supply tasty, desalinated water at a reasonable price, all villagers, including the poorer ones who tend to drink contaminated, salty water regularly, will probably opt to consistently drink clean and healthy water, even if they have to buy it. The problem is beyond just taste. 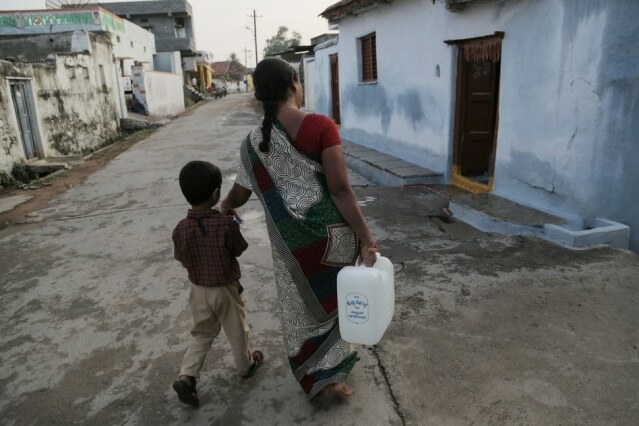 Several villages in India have to dig about 50 to 70 m to build new wells and access water. India’s climate is hot and dry for a majority of the year, and rainfall is typically isolated to the three-month monsoon season. India’s population has crossed 1.3 billion people, making it the second most populated country in the world, and increasing the demand for water. However water remains scarce. Therefore many villages like Mhasawad have to dig deep to obtain the ground water. The water table in the ground is dependent on the amount of rainfall. Overdrawing the water will reduce the water table especially when it has not been replenished by rains. The aquifers will then get deeper and deeper in order to access more water, but the water’s salinity level naturally increases with depth in most cases. Therefore, it is crucial to not waste water. But the contrary happens when RO systems are used in these areas. RO systems operate by using a high-pressure pump to force water through a membrane. If the water has more salt content, more energy is required to force the water through. Once the pure water is separated, what is left behind is the concentrated saltwater. This concentrated water would require additional power to force it through the membrane, which in turn would raise the costs. The costs then outweigh the benefits, thus manufacturers do not attempt a second round of purification to keep the costs down. Now, this results in huge quantities rejected water. For instance, in Chellur, a city outside of Hyderabad, the reject rate is nearly 70 % — which means that 70 % of potential drinking water is wasted without getting desalinated. Wright and Winter want to build a system that is affordable, consumes less energy, and produces less waste. It’s a huge challenge, and it cannot be solved by just simplifying a system common in a developed country. They located a system capable of handling salinity of brackish groundwater found in rural villages. The electrodialysis reversal (EDR) was the chosen system, it needed 25 to 70 % lesser energy than RO when operated in areas where the typical salinity level ranged between 500 and 2,000 ppm. It was also able to recover over 90 % of the feed water. EDR has been in the market since the 1960s. It functions by pumping feed water via a stack next to alternating cation and anion exchange membranes. The anions in the water are moved toward the anode but are blocked by the cation exchange membranes when a voltage is transmitted across the stack. This allows only the cations to pass. Thus, the feed water is rid of salt and the resulting concentrate flow is recirculated until it is too salty to carry on. Then it is pumped into a close by evaporation pond. Wright’s system is able to kill biological contaminants in the water as well by using UV light. Winter and Wright were able to save energy as the water does not have to be forced through a membrane, therefore the required pressure and relative pumping power is a lot lower than in RO systems. This energy saver also paves the way for affordable solar-powered desalination systems, as they do not require as many solar panels now. The researchers use solar power instead of grid electricity, thus bypassing the Indian electrical grid altogether which is not reliable. This has resulted in reduced operational and capital costs at the same time. Another advantage with EDR is that it uses stacks of exchange membranes, which have to be replaced once every 10 years. EDR also does not require any filters, thus decreasing maintenance costs as filters and membranes do not have to be replaced frequently. The capital costs of the team’s photovoltaic (PV)-EDR system will be based on whether they can manufacture their own stacks. The team aims to gain a one-time investment of about 755,000 rupees, which is equal to the cost of existing community on-grid RO systems. In Bahdupet, outside of Hyderabad, the local government spends about 7,600 rupees per month to provide power for its village RO system, pay the plant operator, and replace cartridges and filters. The government incurs no loss but also does not make any profit. Opting to use Wright’s system would reduce their monthly costs approximately in half, and they could then reinvest the savings into their town’s development and needs. Wright and Winter have designed, constructed, and tested their prototype system. Next, they plan to install it in a village outside of Hyderabad, where the people rely on a village-scale RO system at the moment. This RO system was initially sold to them by a local company called Tata Projects on loan. Wright and Winter have partnered with Tata Projects to assist the company to enhance their village-scale water desalination systems and then potentially shifting to the PV-EDR systems Wright is creating. In the meantime, Wright is exploring methods to make the system more efficient — for instance, using different architectures for the EDR stack. She is also coordinating with GEAR Lab graduate students David Bian and Sterling Watson to cost-optimize the integrated solar power and EDR system. At present, the solar panels are fitted with batteries to store up additional solar power and spread it uniformly throughout the day, but they are exploring alternative designs that would allow the solar panels to connect directly to the EDR stack while maintaining a stable supply of power throughout 24 hours. If we can solve that problem, we can potentially provide about 250 million people in India who currently drink salty groundwater a safe and affordable source of water. The MIT Tata Center catalyzed GEAR Lab’s desalination work and, along with Jain Irrigation, allowed them to take part and win the previous year’s USAID Desal Prize. GEAR Lab has also received financial assistance from Tata projects, UNICEF, and USAID for this project.